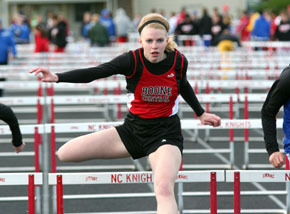 Nine Boone Central athletes overcame tough B-4 District competition and brisk, chilly winds at Norfolk May 13 to secure berths in the Nebraska State Track & Field Championships at Omaha Burke Friday and Saturday (May 21-22). The Cardinal girls placed third in the district team standings with 83 points, trailing only Pierce (101) and Scotus (91). The BC boys did not have similar team success, but competed well in a strong field while compiling numerous season and/or personal bests. “Our district always consists of good teams that do well at the state level, so you have to perform at your best to place,” noted Boone Central Coach Kris Pestel. “The amount of fight in our girls and boys teams was fantastic! “There were some tough breaks for some athletes, but also some tremendous performances,” Pestel praised. 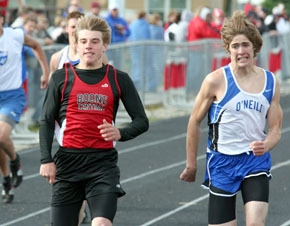 “We continued to improve, having 19 personal-bests – 14 by the boys and five by the girls, not counting relays. All in all, Pestel and her fellow coaches were extremely pleased with Cardinal efforts this spring, which culminated in a second consecutive Mid-State Conference girls championship and Thursday’s strong district showing. 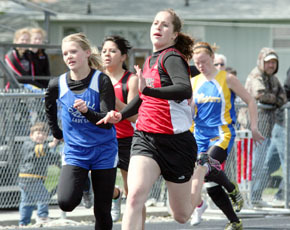 “What made the 2010 track & field season great was the kids’ drive to excel and the passion they competed with,” Pestel said. “Every athlete has made improvements in their individual performances, which has helped the team to set and reach some high goals. Gold medals were elusive for the Cardinals in the B-4 District (the 4-x-100 girls relay team scoring the only event victory), while silver was the color of the day with five 2nd place performances by Boone Central athletes. The BC 4-x-100 relay team highlighted the day at the Norfolk Catholic athletic field, breaking 51 seconds for the first time this season. The group of sophomore Jaime Kennedy, senior Savannah Baker, sophomore Breann Thorberg and junior Bobbi Beckwith nailed a 50.90 to defeat Mid-State rival Norfolk Catholic by 4/10ths of a second. The same foursome also sliced nearly four seconds off their season best in the 4-x-400 event, clocking a 4:12.9 to finish 2nd to Pierce and also qualify for the state meet. The Cardinal girls added silver medals in the sprints and weight throws. Beckwith dashed to a runner-up finish in the 200 meter dash behind Scotus standout Amber Ewers by matching her best 2010 time of 26.2. Kennedy placed 2nd to Ewers in the 100 dash with a 12.9 clocking. In field event competition, Boone Central captured silver in both throws. Sophomore Kattie Cleveland uncorked a 37’5 shot put for 2nd place and junior Sara Wells threw 115’11 to take discus runner-up honors. A veteran and a newcomer will represent the Cardinal boys in Omaha this week. Senior Kevin Carder earned another trip to the state meet by placing 4th in the 3200 meter run with a fast 10:07.4 – establishing a new Albion News Area best in that event. Freshman Blake Slizoski dashed to his best times in the 100 meters (11.40) and 200 meters (23.3), placing 4th and qualifying for the state meet in both events.